Winter Wonderlandis a bit of a shock for the first-time visitor. You turn up expecting an ice rink, a few stalls selling mulled wine and the odd person in a festive costume. Instead you find a full-fledged theme park taking up a vast chunk of central London. The ice rink and mulled wine are both still present, of course, but there are now over 100 different attractions and shows – this year, for example, they have a performance of Cinderella on Ice featuring a host of medal-winning figure skaters. The most extreme of the rides is also the world’s biggest portable rollercoaster, the ‘Munich Looping’. But there are plenty of milder attractions for those too young, old or sensible to think that a high-speed rollercoaster pulling off four consecutive loop-the-loops is a good idea. Among the gentler options is a 60m observation wheel – roughly half the height of the London Eye, and offering a very different perspective – and the ‘Magical Ice Kingdom’ walkthrough, brimming with ice sculptures. There is also a circus tent with a number of different shows, and a chance to visit Santa. The German-sounding name of that ‘Munich’ rollercoaster isn’t a coincidence, incidentally. The whole place has a very German feel to it, with many of the rides (and the staff who operate them) seemingly transported across from Oktoberfest in Bavaria to Christmas in London. Much of the food and drink is overwhelmingly Teutonic as well – and that’s no bad thing, however, since our giant Bratwurst hot dog and continental-style chips were delicious, extremely generous and very reasonably-priced at £5.50 and £3.50 respectively. Prices in general were pretty reasonable given the location: a family ice skating ticket for four people is £42 at peak time (less than at nearby Somerset House), while the same for the observation wheel is £24 and for the Ice Kingdom £36. Tickets for the hour-long Cinderella on Ice show were just under £20 (£16 for children) with a ticket for a family coming in at £63. Funfair ride prices are a bit more hit-and-miss – you’d do a double-take if your local funfair charged £6 for a dodgem, but £9 a go for the most extreme rides is probably in line with what you’d end up spending at a theme park. And at Winter Wonderland, those who are happy merely to watch young, smiling faces don’t have to pay an entry fee for the privilege. Winter Wonderland runs until January 2, and entry is free. You can get full details, and book attraction tickets, at hydeparkwinterwonderland.com. There are now six of these festivals across the country, in London, Birmingham, Manchester, Leeds and Glasgow. Each one features winding trail covering acres of parkland lit up by giant, handcrafted displays made with tens of thousands of lightbulbs, including structures more than 65ft wide and dragons the length of three buses. 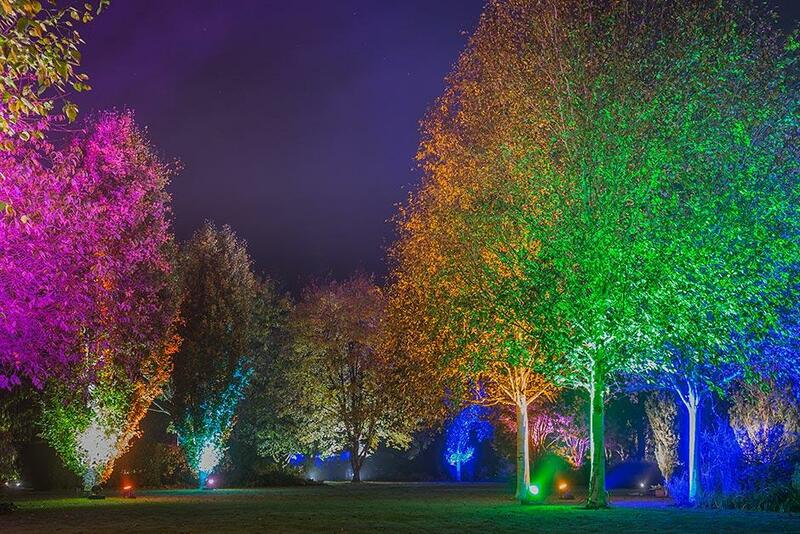 The festivals run until January 1 – ticket prices vary by venue but start from £10 (£8 for children) – get more details from www.magicallantern.uk. Wander the Winter Garden, lit up by colour-changing lights, then stop at the award-winning Garden Kitchen Restaurant—open late—for a simple hot supper. The illuminations are open until January 6. For opening times and admission prices see the website at www.rhs.org.uk/rosemoor. The safari park and stately home has a number of seasonal special activities, not least a lantern festival similar to the ones listed above. The safari park is closed, but the house is open and is ­decorated for an Edwardian Christmas. The festival runs until January 7th. Full details and prices are at www.longleat.co.uk/whats-on. For any young Harry Potter fans a visit to Warner Bros’ Harry Potter studio is a magical idea for Christmas. As well as the usual ‘making of’ experience, you can also see the Great Hall and Gryffindor common room made out in snowy, Christmassy fashion.